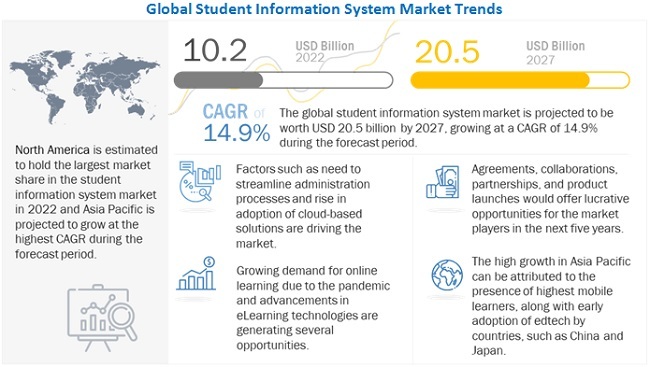 [114 Pages Report] MarketsandMarkets expects the global student information system market size to grow from USD 5.0 billion in 2018 to USD 9.0 billion by 2023, at a Compound Annual Growth Rate (CAGR) of 12.4 % during the forecast period. The major growth drivers of the market include technological advancements in the education sector and government initiatives. Educational institutions are looking for a solution that can easily align with their internal processes and improve its efficiency. With the increased focus on operational efficiency of educational institutions, the demand for the student information system is increasing across the globe. Institutions leverage student information system to improve the quality of education while keeping the expenses minimum. The cloud-based solution reduces the overall costs while providing highly flexible and scalable access to solutions. Companies are deploying student information system on cloud to improve mobility and scalability. Security of the student information system is higher in on-premises deployment type; however, cloud-based student information system enables organizations to reduce the costs related to the solution, storage, and technical staff. Due to these advantages, many vendors are switching from on-premises deployment mode to the SaaS-based software. 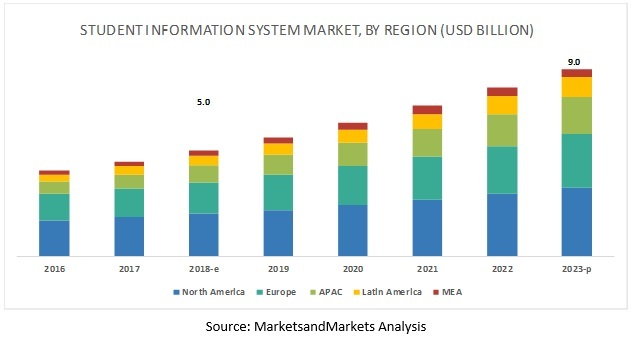 North America is expected to hold the largest market size and dominate the student information system market from 2018 to 2023. North America has the highest rate of adoption of technologies, such as cloud, IoT, mobility, big data, analytics, and digital transformation. The presence of a large number of student information system solution vendors, continuous advancements in technology, and availability of proficient technical expertise are some of the factors contributing to the growth of the market in North America. APAC is expected to provide lucrative opportunities for the student information system vendors, as the education institutions in APAC have started implementating the digital solutions to improve the operational efficiency. However, lack of expertise and infrastructure among the end users in various regions could affect the growth of the student information system market. 15 major vendors offer student information system solution and services across the globe, and they are SAP (Germany), Oracle (US), Ellucian (US), Workday (US), Jenzabar (US), Unit4 (Netherlands), Skyward (US), Arth Infosoft (India), Tribal Group (UK), Campus Management (US), PowerSchool (US), Foradian Technologies (India), Illuminate Education (US), ComSpec International (US), and Focus School Software (US). SAP is a leader in offering an extensive set of solutions and services in the student information system market, caters to the needs of organizations across the globe. The company offers a student information system for efficient student life cycle management, student engagement, student and learning analytics, and institutional performance. The company offers solutions, such as SAP Student Activity Hub, SAP S/4HANA, and SAP Hybris Commerce. SAP Student Activity Hub helps customers improve educational results with a single view of student progress, collate data across systems, and perform advanced analytics for developing effective programs and processes. SAP S/4HANA offers simplified coordination, integrated services, and enhanced student engagement resulting in increased operational efficiency. In October 2018, Oracle released new cloud enhancements in its Oracle Student Cloud suite. This new enhancement includes Student Management product, which offers support for traditional programs. Moreover, Oracle announced integration for the customers of campus solutions to Oracle Student Financial Planning. In October 2018, Ellucian partnered with Bluewater, a consulting services firm for learning and talent management systems. Bluewater offers implementation services to Ellucian customers leading to maximized technology investments and accelerated development of employees, partners, and students. In May 2018, Oracle acquired Vocado, an education financing firm. Vocado offers student-centric and cloud-based financial aid for higher education institutions. Vocado solution would be integrated with Oracle Student Cloud platform to offer enhanced SIS capabilities to customers. This combination would help customers of both companies manage financial aid more strategically and solve academic complexities of students efficiently. In September 2016, Workday launched its full cloud-based SIS Workday Student. The company is focused on offering multimedia and student success features. Workday Student includes student recruiting, admissions, curriculum management, student records, academic advising, financial aid, and student financials. Workday Student offers the benefits of simplified curriculum management, academic insight management, and automated financial aid. What are the major challenges faced while deploying student information system at the customer end? What are the challenges faced by student information system vendors while integrating it with legacy systems and IT infrastructure? What are the upcoming technological advancements in the student information system market? What are the opportunity areas on which student information system vendors can capitalize upon? * Business Overview, Products/Services/Solutions Offered, Recent Developments, SWOT Analysis, and MnM View Might Not Be Captured in Case of Unlisted Companies. The study involved 4 major activities in estimating the current market size for the student information system market. Exhaustive secondary research was done to collect information on the market. The next step was to validate these findings, assumptions, and sizing with industry experts across the value chain using primary research. Both top-down and bottom-up approaches were employed to estimate the complete market size. After that, the market breakdown and data triangulation procedures were used to estimate the market size of the segments and subsegments of the student information system market. In the secondary research process, various secondary sources, such as D&B Hoovers, Bloomberg BusinessWeek, and Factiva have been referred to identify and collect information for this study. These secondary sources included annual reports, press releases and investor presentations of companies, whitepapers, certified publications and articles by recognized authors, gold standard and silver standard websites, regulatory bodies, trade directories, and databases. After arriving at the overall market size using the market size estimation processes as explained above, the market was split into several segments and subsegments. To complete the overall market engineering process and arrive at the exact statistics of each market segment and subsegment, the data triangulation and market breakdown procedures were employed, wherever applicable. The data was triangulated by studying various factors and trends from both the demand and supply sides. It includes 15 major vendors, namely, SAP (Germany), Oracle (US), Ellucian (US), Workday (US), Jenzabar (US), Unit4 (Netherlands), Skyward (US), Arth Infosoft (India), Tribal Group (UK), Campus Management (US), PowerSchool (US), Foradian Technologies (India), Illuminate Education (US), ComSpec International (US), and Focus School Software (US).